How to Use Detergent with Pressure Washer: Easy If Done Right! Sometimes, sheer water pressure coming from a pressure washer just isn't enough to remove the toughest of stains. In such cases, you'll want to use a compatible detergent to improve your cleaning power. However, this process isn’t as simple as throwing it into the mix right at the beginning of a cleaning job; you should know exactly when to add the soap to get the most use out of it. Certain types of detergent for these machines can come at a high price, so you're going to want to know how to properly use it so that you don't waste a drop. Detergents can come in concentrated forms, which require dilution with water, or as ready-to-use varieties, which can be added directly to the detergent tank of a pressure washer. Often, you’re better off choosing the concentrated forms of cleaning fluid, as you’ll get more for your money with the majority of brands. You'll not only want to make sure that the detergent in question is compatible with your pressure washer, but also that it's the right type of cleaner for the job at hand. It’s worth bearing in mind that some cleaners are only compatible with washers up to a specific level of PSI, so you should be sure that these match first. Next, choose a cleaner that is designed for the surface you're cleaning. Vehicles require an automotive cleaner, which do away with harsh chemicals to protect paintwork, whereas other fluids are suited for other tasks. 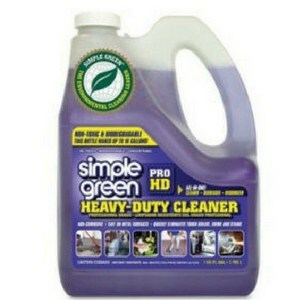 Alternatively, you can pick up a range of detergents that are suited for any type of task (multi-purpose cleaners). Before you even consider using detergent, you should endeavor to loosen the dirt and debris first. If you don't remove the upper layer of sediment first, then the cleaning fluid can't fully reach the core of the problem, which is the staining left behind. ​Such debris might include leaves, twigs and soil; you can remove all this using one of the regular spray nozzles on your pressure washer and plain water. As it’s best to avoid focusing high-pressure jets of water on any decking for a prolonged period, you should try to use a wider, weaker spray nozzle to remove this dirt. This is especially the case if you’re using heated water in a power washer. 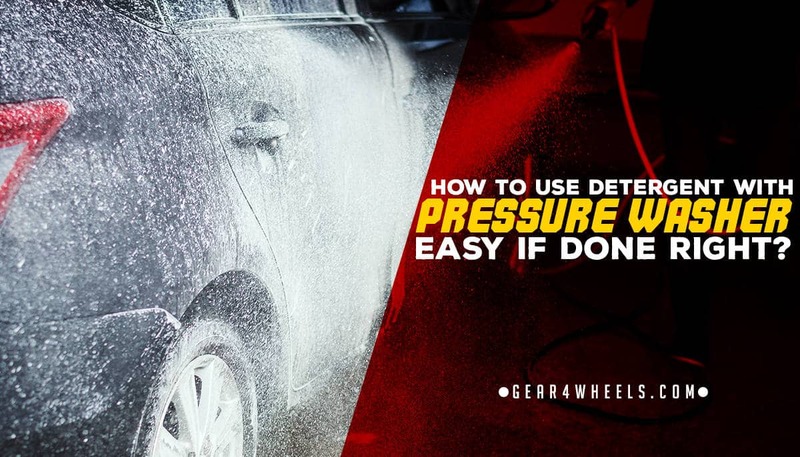 Most pressure washers have a detergent tank that is specially designed for use with cleaning products, which is normally built into the center of the tank’s body. The machine handles the dilution of detergent with water by mixing the fluid and the water together when it reaches the nozzle. Though almost all pressure washers come with a range of nozzles that include a soap nozzle, additional attachments are available that allow direct application of detergents. One such attachment is the pressure washer brush, with the ability to apply soap directly onto the brush's bristles. Additionally, some pressure washers have an extra detergent attachment built into the gun, which allows you to clip a detergent bottle directly onto the side of the gun. This makes access and fluid changes far quicker and easier. As mentioned, you'll be wanting to use a low-pressure nozzle designed for detergent, whilst spraying upwards with your cleaning fluid, overlapping each stroke. Once applied, you should leave the detergent to soak for several minutes. Avoid leaving it longer than 5-10 minutes, as it could leave marks if it dries. This time could be even shorter if it's hot or breezy. Finally, you should reapply a different nozzle and ensure that your detergent tank is turned off, before spraying away the detergent using strokes that move from top to bottom. You don’t have to use detergent in all cleans, but when you’re dealing with tough stains such as oil, grease or chewing gum for example, you’ll want the additional cleaning power of a soap-based cleaning fluid. Select a detergent that is suitable for the pressure rating of your machine, and suitable for the surface that you’re cleaning; and follow the steps above.